Wow where did the summer go!!! It was scorching hot here one day and then the next day the cool weather was here and a dump of snow!!! That's Alberta weather for you!!! 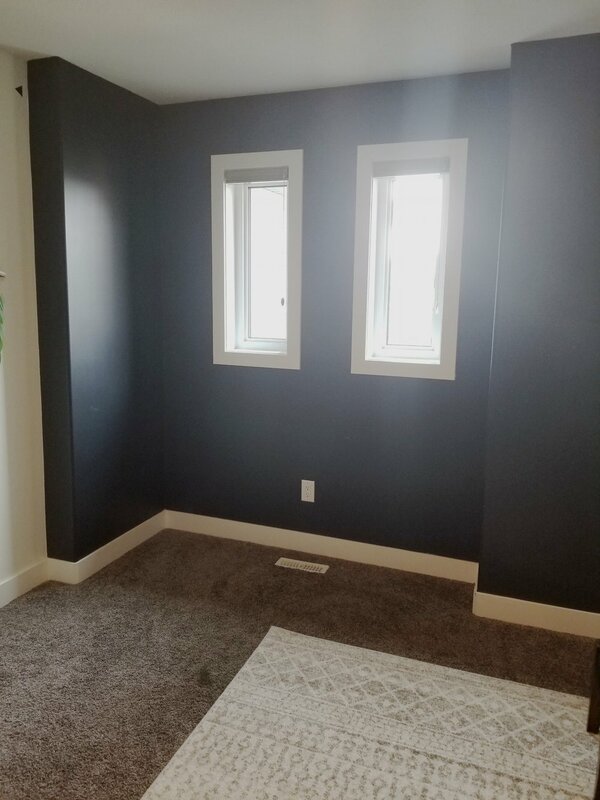 As the boys have been growing like weeds, I really wanted to refresh there room for a couple different reasons. I wanted it to feel more grown up and also find smart solutions to organize there space a bit better. I'll explain the method to the madness! Design by Crave Interiors This is there room initially. When it’s time to start the initial design of a space, the first thing I always do is go on a Pinterest spree!!! Once I have a board, I break down a few to really start narrowing the style and look I'm trying to achieve. In all my pins and even my more recent projects I have been loving a fresh bright white space!!!! As much as I loved that blue wall it was time to go! The windows are south facing but they are quite small so the white should brighten the room up. My go to is "Simply White" by Benjamin Moore. When it comes to selecting what type of paint I always go with a latex base instead of a oil based, as the oil based paints have chemicals that can make your white go yellow over time. That would not look good! So latex it is!!! People often have a hard time committing to white and I fully admit I did too for a long time. I was afraid it would feel like a hospital and feel cold. Now that I painted my entire main floor this year in the same color “Simply White” here’s a couple reasons why I like it. White reflects Light! Also it feels comforting to me. There something about a bright, fresh, clean space! I find it’s easier to decorate with white! I add my colour through the textiles, art, furniture, lighting and accessories. Next is lighting! A well lit room can make a world of difference in how you feel in a space. The secret sauce to a well lit room I find is don’t try to light the whole room with one light. Instead light it in layers. In the boys room I have several layers that blend nicely together. Of course there main light, a lamp on there nightstand and these sconces by Roanoak Co to give the boys a task light to read at night. 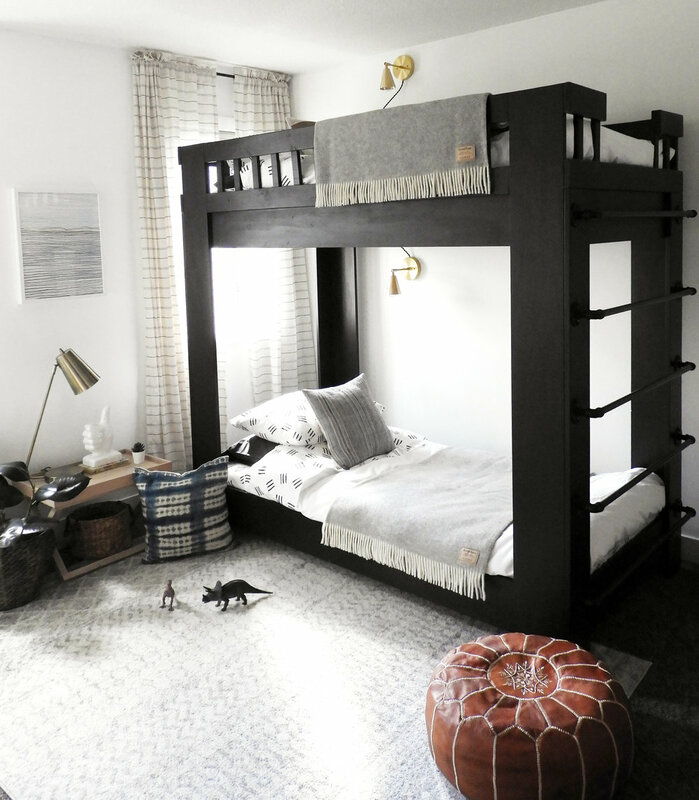 It gives the room so much personalityI My initial inspiration came from Amber Lewis’s bunk bed room she did! I’ll pop that below just cause it’s so dang gorgeous!! You know the room i’m talking about right? Bedding is a serious choice when it comes to designing a bedroom and not just for looks but for comfort! Did you know If your average night's sleep is eight hours (ie one third of a day), one sleeps for one third of one's life. If you live, say, 75 years, that's 25 years asleep, or 9,125 days. Which with the kids they definitely get that and then some. Spending that much time in bed you want comfort. Finally giving the room style and personality. I love using textiles and a mix of old and new. I find it makes a space feel warm and the aesthetic mixes perfect with this new build. To ground those bunkbeds and soften the space I loved this rug by Modern Komfort called the Elaziz. Let's be real I love everything from there store!!! Anywhooo, the most important thing when choosing a rug for a space Is to make sure it's the right size. What I do, is measure the furniture and always make sure it's a bit bigger. Measure twice if you have too! Believe me from experience where it has been a costly mistake! Now bring the room to life! I was inspired by the art by Jorey Hurley. Again grabbing the blues I love so much and very minimal, framed it white, it really added some colour and interest in a inconspicuous way. Of course carrying the horizontal lines from the curtains too. I always love adding plants and then of course mixing modern and vintage pieces really adds character and depth. I am a huge lover of handmade vintage pillows, giving this space a bohemian touch. I am beyond happy and the boys are too, seeing them race to play in here after school makes this project worth all the hard work!!! Hope you found some inspiration and feel free to ask any questions below! This post was a collaborative project with Brook Linen, Roanoak Co, Modern Komfort and Jorey Hurley. I love to share my own opinions while staying true to my style and what helps you decide and inspire for your next project. Thank you for your support!